"I invite each of us to consider this question. 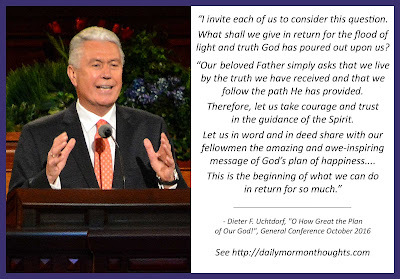 What shall we give in return for the flood of light and truth God has poured out upon us? "Our beloved Father simply asks that we live by the truth we have received and that we follow the path He has provided. Therefore, let us take courage and trust in the guidance of the Spirit. Let us in word and in deed share with our fellowmen the amazing and awe-inspiring message of God’s plan of happiness. May our motive be our love for God and for His children, for they are our brothers and sisters. This is the beginning of what we can do in return for so much. "Someday 'every knee shall bow, and every tongue confess' that God’s ways are just and His plan is perfect (Mosiah 27:31). For you and me, let that day be today. Let us proclaim, with Jacob of old, 'O how great the plan of our God!' 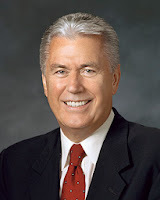 (2 Nephi 9:13; see also verses 8–12, 14–20.)" We often take for granted "the flood of light and truth" that blesses our lives today. We live in a time of remarkable insight, accessible information, and plentiful revelation. Once we understand and acknowledge the greatness of that gift, how do we respond? "What shall we give in return"? It's interesting to ponder how well our lives express gratitude to God for His blessings to us. I was grateful for the reminder in the closing paragraph: if every knee will eventually bow in acknowledgement "that God’s ways are just and His plan is perfect" then why not "let that day be today" for those of us who know His great plan for our happiness. Labels: blessings, gratitude, Uchtdorf Dieter F.